CLEVELAND, Ohio — Scott Nagy thought a dad’s promise ought to be kept. He kept his. The cancer invading his body doesn’t give him much time. 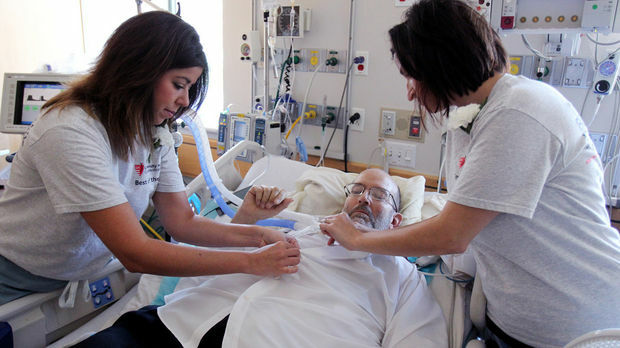 A volunteer team of medical professionals gave him enough on Saturday to keep a vow to his daughter on her wedding day. 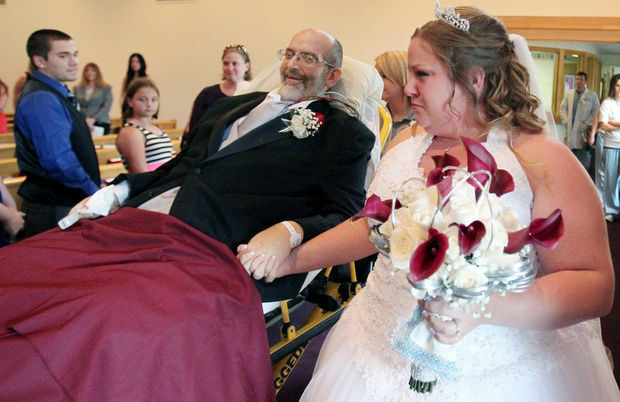 He made the crosstown trip by ambulance, from an intensive-care bed at University Hospitals Seidman Cancer Center to First Evangelical Lutheran Church in Strongsville. Monitor cords ran from under his charcoal tuxedo, and a tracheal tube loosened his tie. “We did it,” Nagy said with a reassuring smile, telling his daughter he was just a small part of her day and warning she’d streak her makeup. Jacky Uljanic, the UH nurse practioner who turned wedding planner for the occasion, passed around tissues. Nagy kissed a rambunctious ringbearing grandson and gave a thumbs up. Previous Post: MA school Crossing Guard Receives Special Message & Lunch! Went to High School with Scott, He was always a perfect gentleman and just a really nice guy. Very touched by this story. Thank you so much for stopping by and sharing your lovely memory of Scott. It’s much appreciated. So inspirational and a true definition of a father’s love!